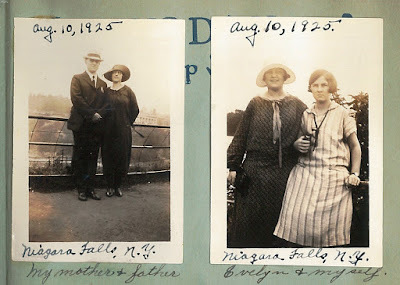 Eunice Downing was the daughter of Roy and Bertha (Haller) Downing. Her father Roy M. Downing was the U.S. Deputy Collector of Customs in Sandusky for 48 years. Eunice kept a friendship book during her high school years. She was a 1929 graduate of Sandusky High School. 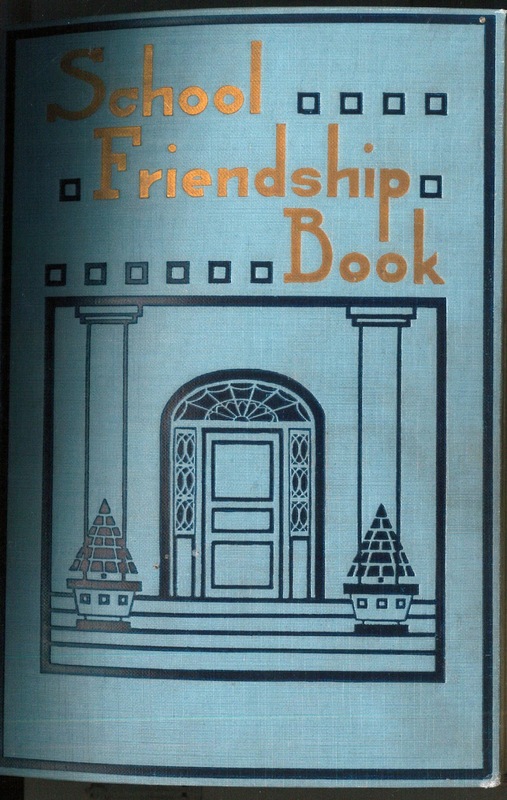 The School Friendship Book was designed and illustrated by Clara Powers Wilson and was published by the Reilly & Lee Company of Chicago in 1910. (The 1916 edition of this title sold for $1.00.) 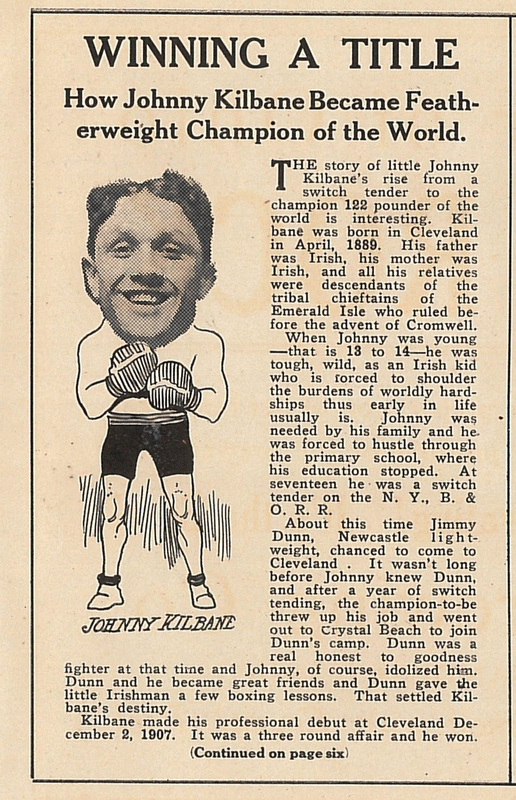 The book provided pages for autographs and photographs. And when your (sic) dead it’s spades. A certificate of proficiency from the Remington Typewriter Company appears on page 44. Eunice could type at a net speed of 29 words per minute for fifteen consecutive minutes. Also included in the friendship book were programs from art shows, concerts, and tally cards from many bridge games. Napkins, decorations, favors, and invitations found in the book have retained their original bright colors. Eunice’s book includes birthday cards, Christmas cards, Valentines, and graduation cards from the late 1920’s. Newspaper clippings from Sandusky High School sporting events, honor roll announcements, and Sandusky social and church events allow us to learn what was important to Eunice in her teenage years. 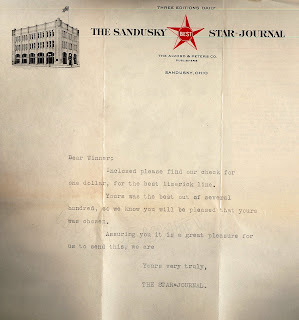 Eunice was the winner of a limerick contest sponsored by the Sandusky Star Journal, and she kept her letter of congratulations from the Star Journal. 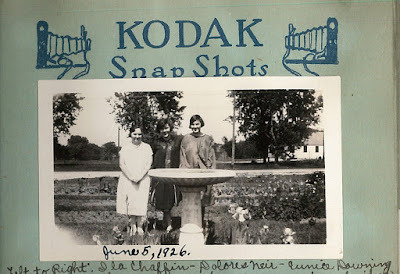 The “Kodak Snap Shots” section of the friendship book features several photographs of Eunice and her family and friends. In the picture below are: Ila Chaffin, Dolores Neir and Eunice Downing. 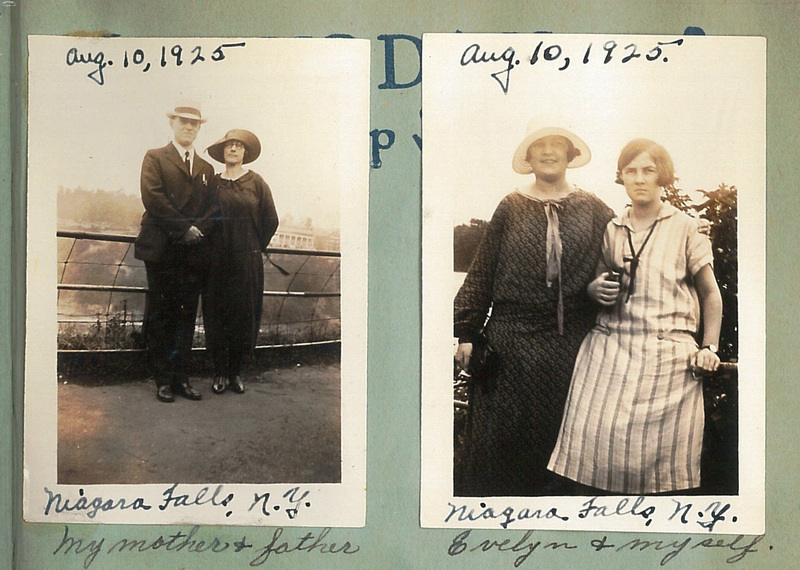 Below are snapshots from a family trip to Niagara Falls in 1925. After graduating from Sandusky High, Eunice Downing was a teller at the Western Security Bank. She married Myron G. Kryeski, and they were married for 35 years. Eunice died on May 17, 1987. Eunice and Myron Kryeski donated many items to the historical collections of the Sandusky Library Archives Research Center. The Roy Downing Maritime Collection, in memory of Eunice’s father, contains many photographs of Great Lakes ships from 1902 through 1950, the years that Mr. Downing was with the Sandusky Customs Office. By looking through Eunice’s School Friendship Book, one can get a vivid view of the life of a young lady from a former generation in Sandusky. 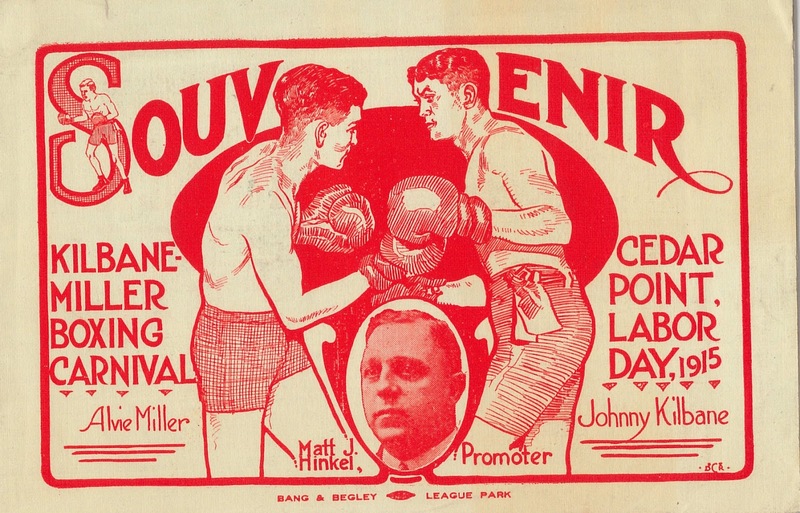 The friendship books of both Eunice and her sister Evelyn Downing can be seen at the Archives Research Center of the Sandusky Library. William Gaylord was born on July 31, 1838, and grew up on a farm in Morrow County, Ohio. He began studying medicine with Dr. J.D. Buck of Cincinnati, Ohio in 1878, and later attended the Pulte Medical College in Cincinnati. While studying medicine during the day, he worked as a locomotive engineer during the evening, at the throttle of an express engine that ran from Cincinnati to Richmond. 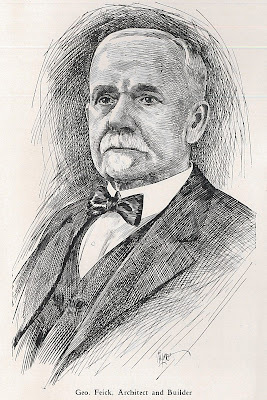 After graduating from Pulte Medical College in 1883, he soon was appointed as lecturer on histology and microscopy, eventually becoming the Chair of Dermatology and Microscopy at his alma mater. 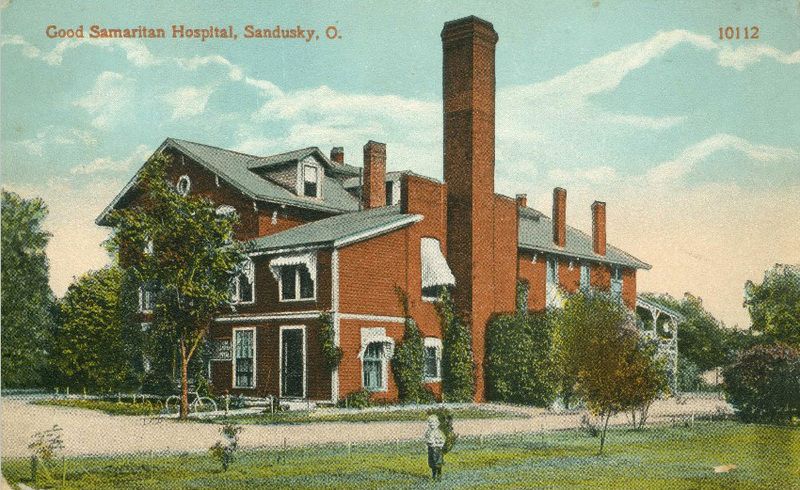 Dr. Gaylord moved to Sandusky in 1885, and was appointed visiting physician to the Good Samaritan Hospital in 1890. In 1891 Dr. William Gaylord married Miss Loie A. Childs, a Sandusky school teacher and graduate of Oberlin College. Dr. Gaylord had a successful medical practice in Sandusky. He treated people from all walks of life, and provided medical services even to those who were unable to pay him. On January 4, 1900, Dr. William Gaylord died of apoplexy (what we would call a stroke today). He had been at the bedside of his ill wife, and was weary from overwork just prior to the time of his death. A tribute was paid to the late Dr. Gaylord at the Proceedings of the 36th Annual Session of the Homeopathic Medical Society of the State of Ohio. Dr. Gaylord was laid to rest at Oakland Cemetery. His wife Loie died of pneumonia on November 13, 1916, leaving behind a son and daughter. 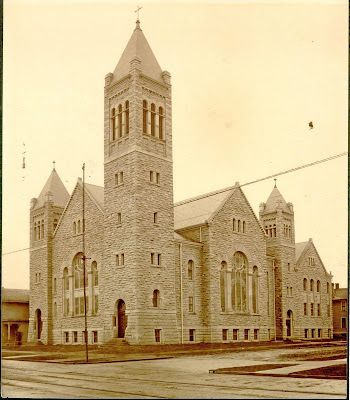 After holding classes in the old Lutheran church in Washington Park since 1891, Zion Lutheran Church dedicated a new parochial school at the southeast corner of Decatur and Madison Streets on September 24, 1899. 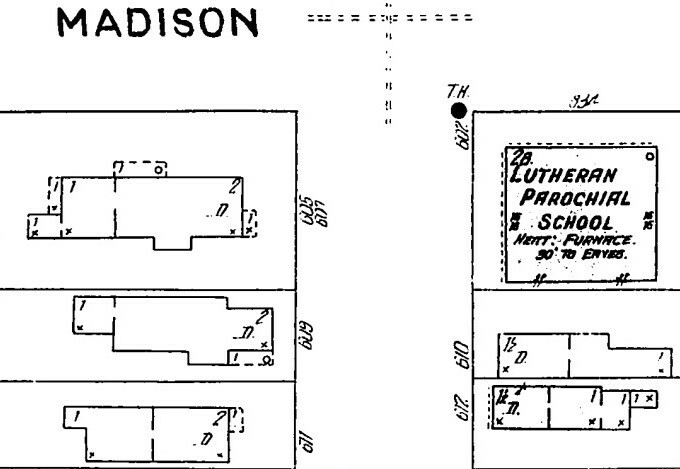 A diagram of the Lutheran Parochial School is visible on the 1905 Sanborn Fire Insurance map. 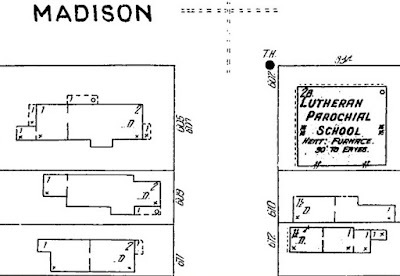 The builder of the school was George Feick, a member of the Zion Lutheran Church’s congregation. 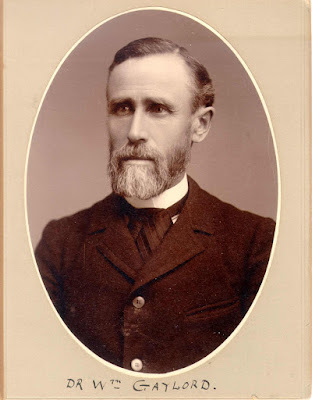 George Feick was also the architect and builder of Zion Lutheran Church’s new building which was under construction at the time that the school opened. 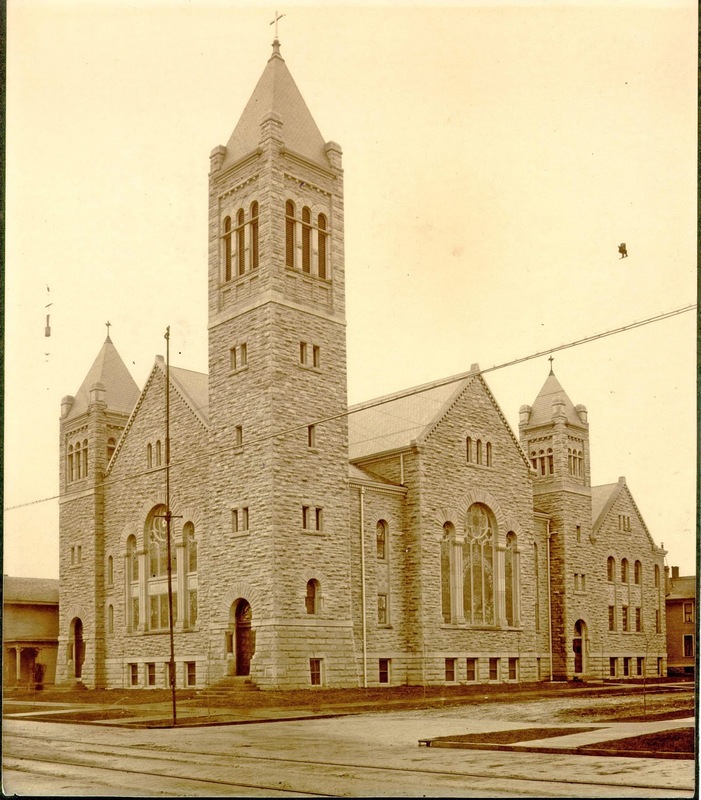 The first service in the new Zion Lutheran Church building was on November 19, 1899. The Reverend G. Mochel of Fremont gave a sermon on “Christian Education” at the dedication of the Lutheran School. An article in the September 25, 1899 issue of the Sandusky Register reported that the school, constructed from Sandusky limestone, was “one of the finest and most complete” buildings in the city. 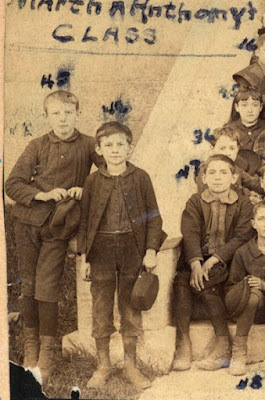 The lot for the school had been purchased for $1000, and the schoolhouse was built for $6000. Rev. Theodore J.C. Stellhorn concluded the dedication service with prayer, and all were invited in to view the new Lutheran school. The teachers at the Lutheran Parochial School, from 1891 to 1923, included: Emil Meyer, F. Wiechert, C.F. Knauer, G. Al Allwardt, Carl Schaub, Walter Wietzke, Frank Ruprecht, Otto Woelke, Katherine Dornbirer, Minnie Dornbirer, Lena Lehman, Ella Brehmer, Laura Bing, Elise Gerlach, Bertha Jahraus, Fannie Kahler, Clara Arheit, Katherine Feddersen and Louise Neubiser. 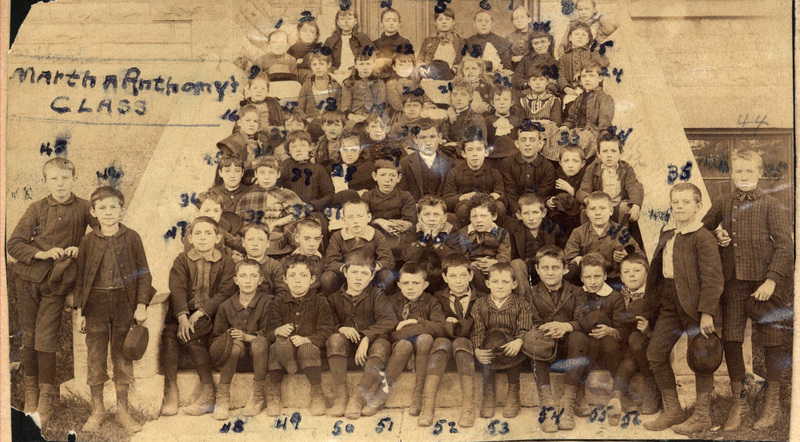 The last year that there were students at the Lutheran School was 1923. 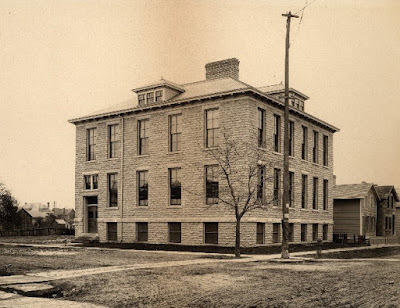 In 1927, the Board of Education of Sandusky Schools purchased the former Lutheran School, and it became a part of the Junior High School, known for many years as Jackson Junior High School. You can see the former Lutheran School on Madison Street in this view from Google Maps. The former Lutheran school was added to the National Register of Historic Places in 1982. The Ohio Historic Places Dictionary states that the Lutheran school was significant because of its role in the education of Protestants of German descent. Worthy R. Brown was born in Port Clinton, Ohio on March 17, 1884. He was the first person to operate charter boats for reel fishing on Lake Erie. He founded Channel Grove Marina in East Harbor, and for many years operated "Sandy Beach," now known as East Harbor State Park. 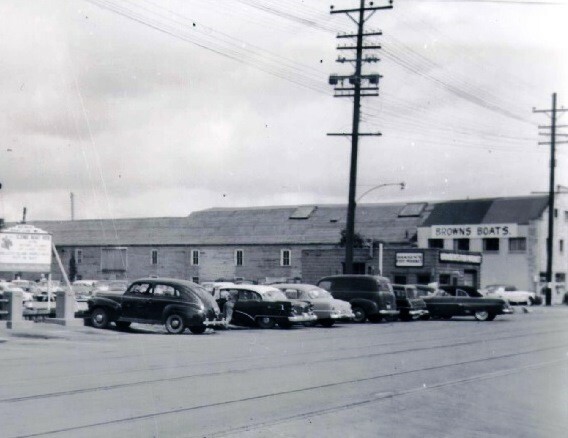 In 1904, Mr. Brown started Worthy Brown & Sons, Inc., which was later known as Brown's Marina. 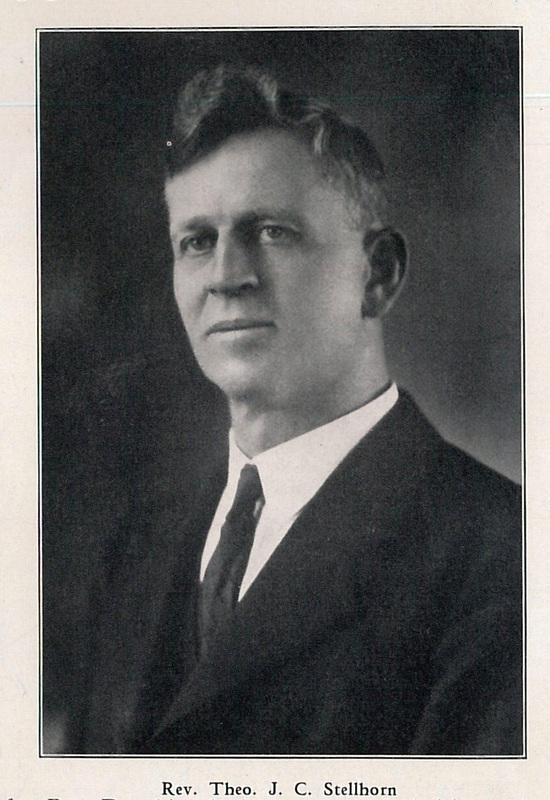 In 1928, he purchased the boats and the route of the Maley Transportation Company. By 1929 Mr. Brown leased space in the G.A. Boeckling building for office use. He changed the company name to Brown’s Boats, Inc. about that time. 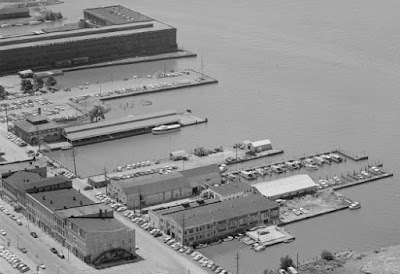 By 1931, Worthy Brown had purchased all the buildings between the Lay Brothers fishery and the east pier, and used the area as a boat docking facility. If you look closely, you can read the words Brown’s Boats, Inc. in the building in the center of the picture below. 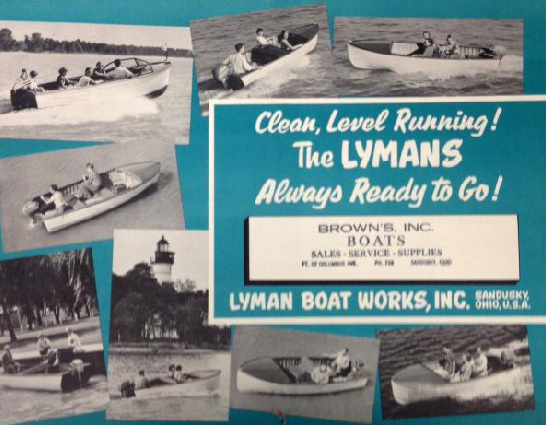 For several years, Brown Boats was the local representative for Lyman Boats Works of Sandusky. 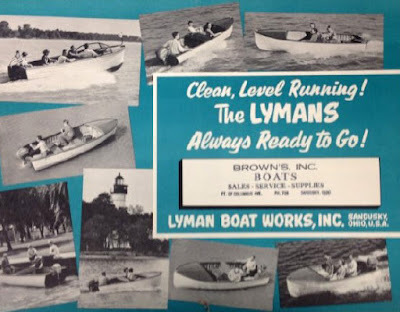 A Lyman boat catalog was included in the 1953 WLEC Time Capsule, which was opened in 2003, and is now housed at the Follett House Museum. 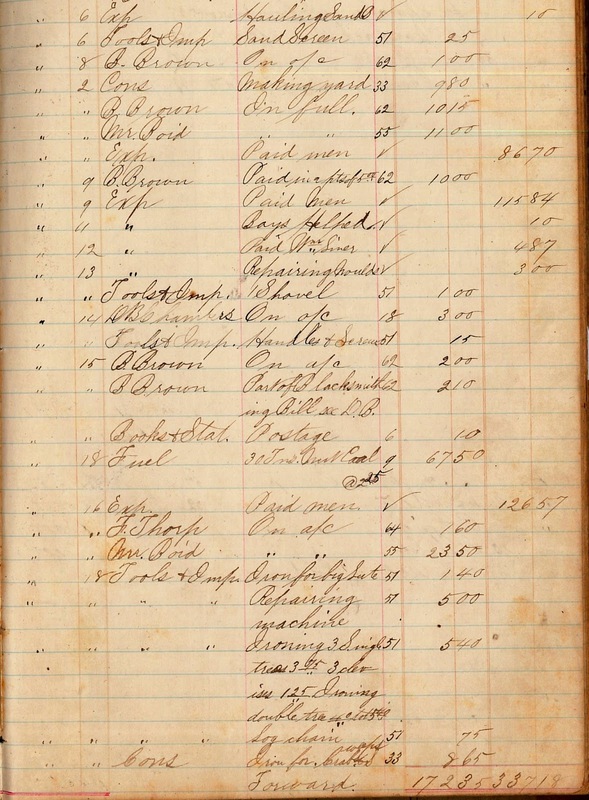 A ledger book from the business of Lee Chambers is housed in the Business Collections of the Archives Research Center of the Sandusky Library. 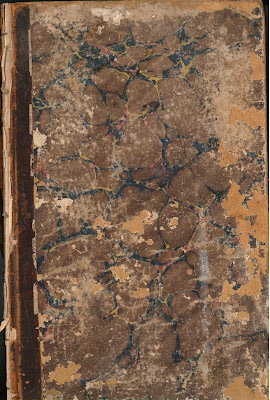 The book dates from March 1865 through May 1889. Lee Chambers was a mason and contractor from the 1850s until his death in 1891. 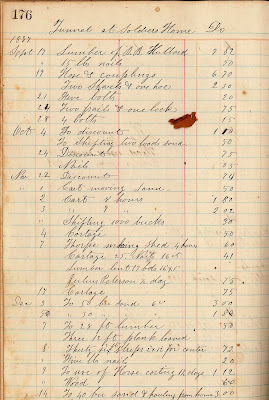 The ledger lists accounts of both household and business transactions. 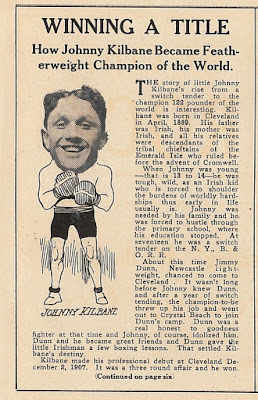 Between 1855 and 1871, according to listings in the Sandusky City Directories, Mr. Chambers was a mason, carpenter, and bricklayer; by 1886 he was listed as a brick manufacturer. Mr. Chambers’ residence, as well as his brickyard, was on the west side of Milan Road, south of the corporation line, not far from Oakland Cemetery. 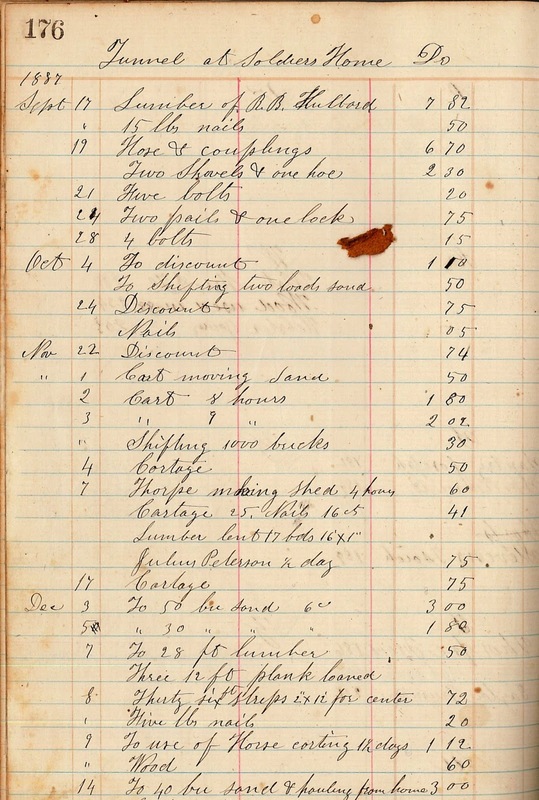 This page of the ledger lists some of Mr. Chambers’ incoming and outgoing expenses in September of 1882. 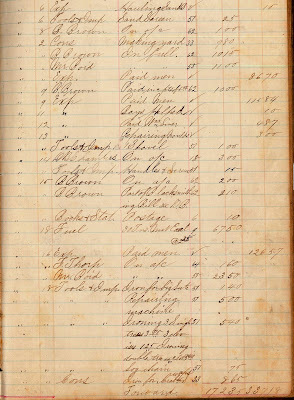 The listings on pages 176 and 177 are related to his involvement in the construction of a tunnel for the Ohio Soldiers’ and Sailors’ Home in 1887. 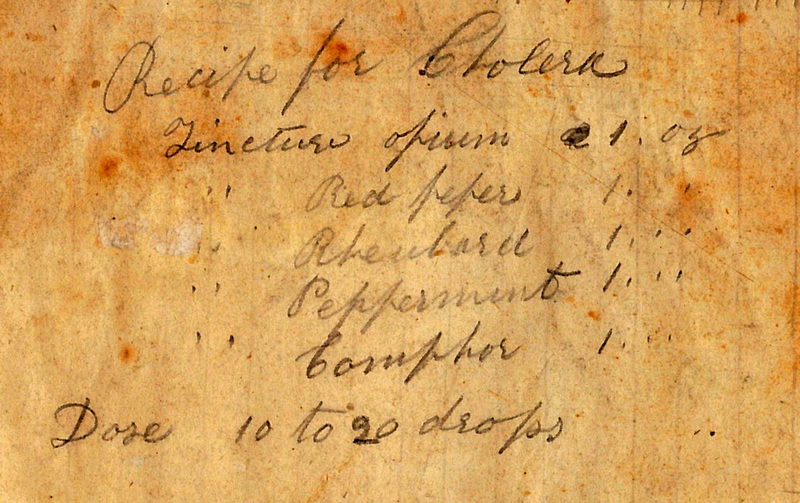 Besides hundreds of business-related entries in the Chambers ledger, there are also details about household expenses and recipes. Below is a handwritten recipe for a remedy for cholera. 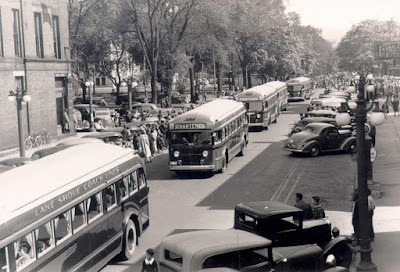 From 1938 until well into the 1940s, the Lake Shore Coach Lines transported passengers by bus from Sandusky to Cleveland, as well as from Sandusky to Toledo. 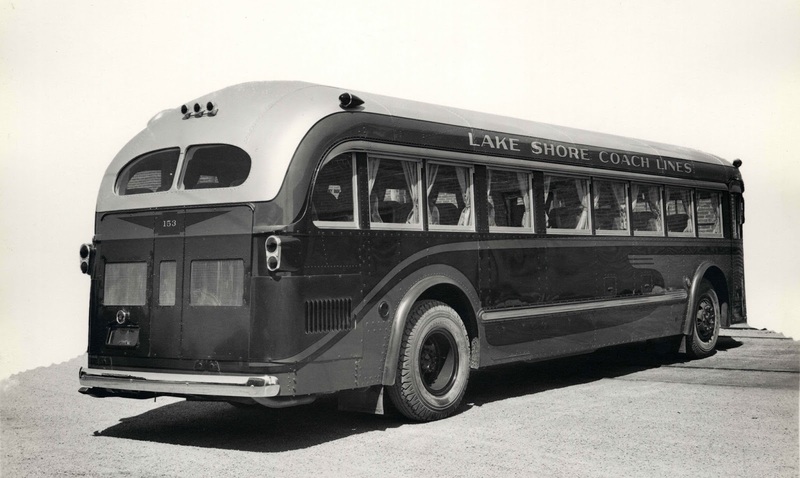 The Lake Shore Coach Lines was created after the Lake Shore Electric Railway lines ceased operations. Several of these buses were manufactured by the Yellow Coach Manufacturing Company. 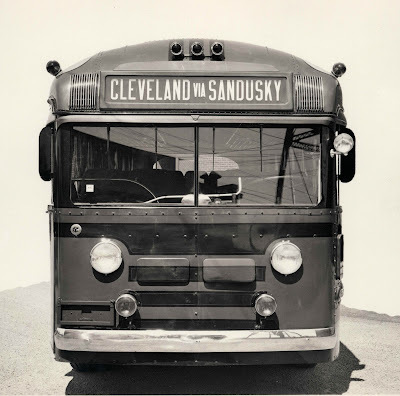 The buses that served Sandusky were Model 742s. Pictured below is bus number 157. Here is a side view of bus number 153. Time tables which appeared in the December 2, 1942 issue of the Sandusky Register Star News indicated that buses traveled daily from Sandusky to Cleveland at 7:30 and 10:05 a.m., and 12:05, 2:05, 3:35, 6:05, 8:35 and 9:55 p.m. daily. 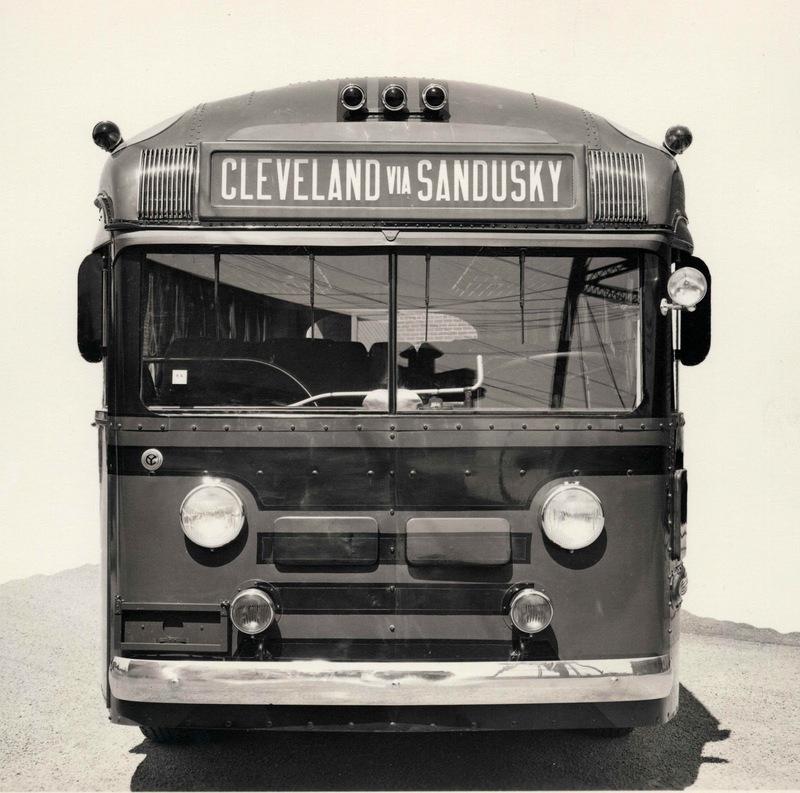 Another 6:20 a.m. route ran from Sandusky to Cleveland every day except Sundays and holidays. The Lake Shore Coach Lines also ran several trips to and from Toledo every day. Having such frequent bus stops in Sandusky would have enabled local residents to work or shop in Cleveland or Toledo quite easily. Many Christmas shoppers enjoyed the convenience of taking the bus to the big city, without having to drive their own vehicle. 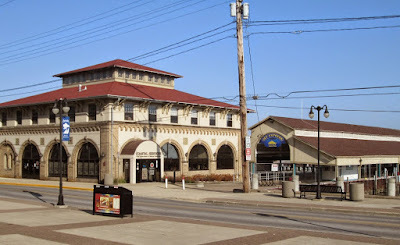 In September of 1943, the Sandusky routes of the Lake Shore Coach Lines were taken over by the Sandusky Rapid Transit. The Lake Shore Coach Company was eventually sold to Greyhound. Today most people drive their own vehicles to and from Toledo and Cleveland, but it is fun to see these images from a time gone by in our community. Walter Ritter donated this picture of an elementary school class taken on the steps of the old Sandusky High School (later Adams Junior High School) in 1883. Martha Anthony (later Mrs. I.C. Brewer), number 16 in the picture, was the original owner of the photograph. Listed as number 40 is Allen Stroud, the son of Dr. C. Eugene Stroud. Allen Stroud became a mail carrier in Sandusky, and he also owned the Stroud Gardens that were adjacent to his home on Milan Road. 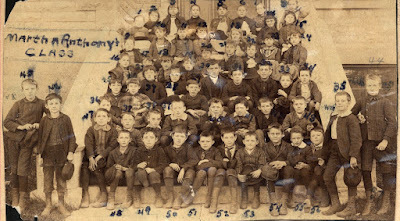 Edward W. Altstaetter, number 46 on the picture, once served as Sandusky’s Mayor. When he passed away in 1970 at the age of 91, he was the oldest insurance agent in the city of Sandusky. 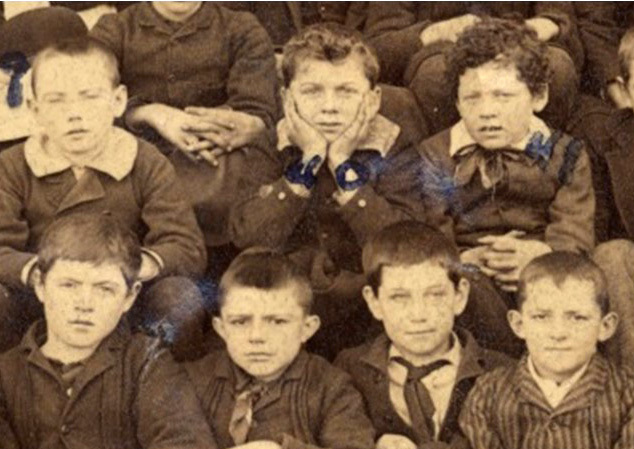 Young Mr. Altstaetter is the second boy from the left in the image below. 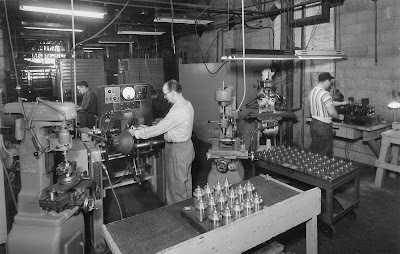 To view hundreds of historic images related to Sandusky and Erie County, see the Past Perfect Local History Archives online. Several employees of the Sandusky Gas and Electric Company are seen in front of the old Power House which was on the west side of Lawrence Street, between Market and Water Streets about 1908. 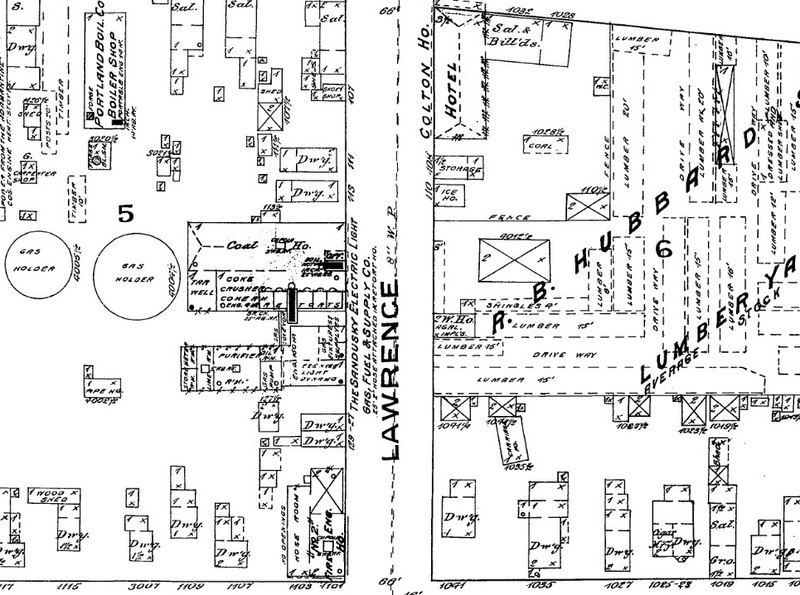 Notes with the original item stated that at that time the company had a “horsepower of one.” The power house can be seen below on the 1886 Sanborn Map. It was then listed as Sandusky Electric Light, Gas, Fuel and Supply Company. 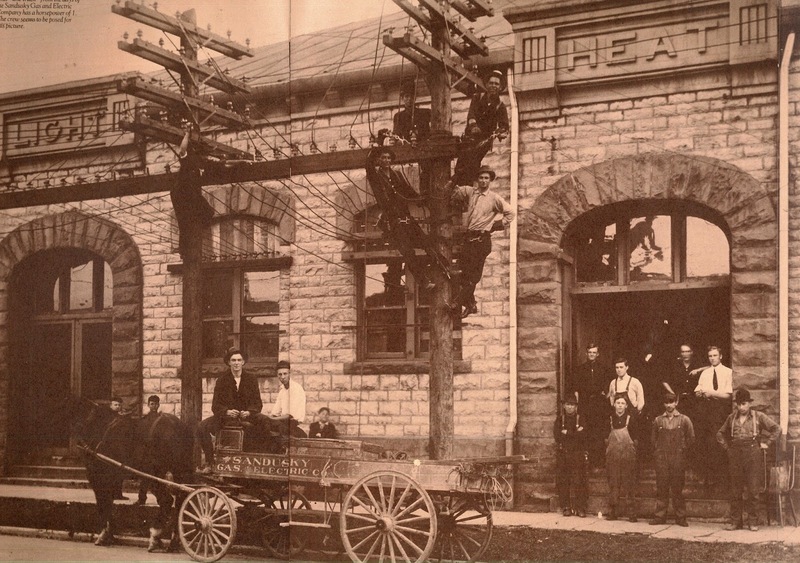 The power house was situated to the south of the old Number 2 Fire Station, and across the street from the R.B. 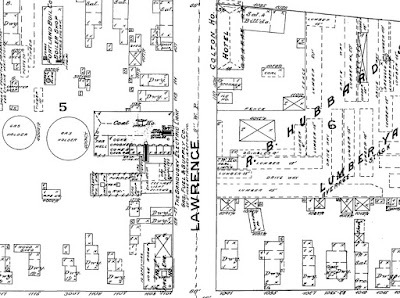 Hubbard & Son Lumber Yard. 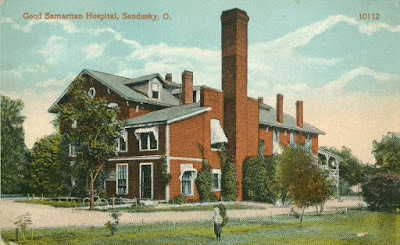 The building was constructed of stone, as were so many early buildings in Sandusky and Erie County. 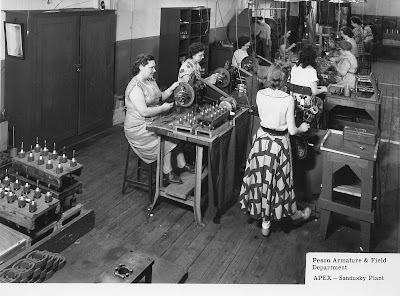 The history of the Sandusky Gas and Light Company is interesting. The company changed names often, as technology changed. According to McKelvey’s 1867 Sandusky City Directory, it began in 1854 as the Sandusky Gas Light Company. 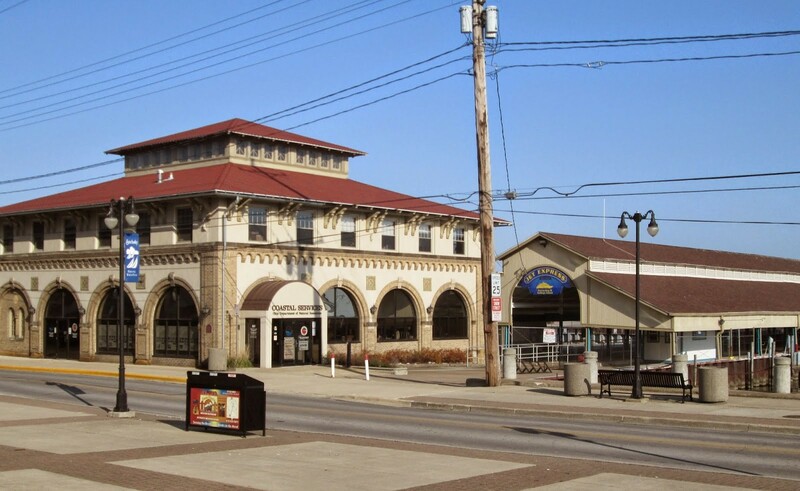 An article in Sandusky of To-Day reported that in 1886 the Sandusky Gas Light Company entered into the electrical field, and had one of the most complete electric stations in the country, with a capacity for 200 arc lights and 1,400 incandescent. 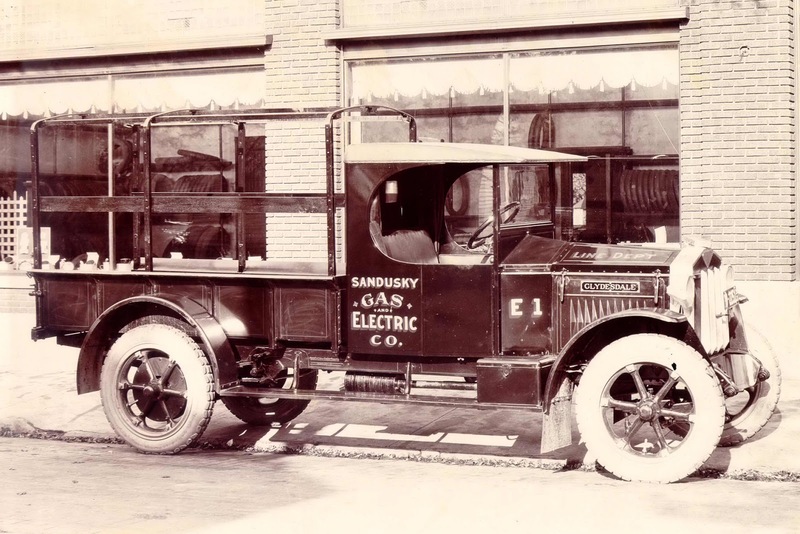 By 1919, the Sandusky Gas and Electric Company eliminated horse-drawn vehicles in all departments, and switched to automobiles. In the 1920s, the Sandusky Gas and Light Company was purchased by Ohio Public Service, a processor of Ohio Edison. The former Sandusky Gas and Light power house in Sandusky no longer stands. This link at Google Maps shows its former location, now a part of Sandusky International Division of MetalTek. Dr. Norbert A. Lange bequeathed a scrapbook to the Sandusky Library Archives Research Center, which he kept during the years he attended the University of Michigan. 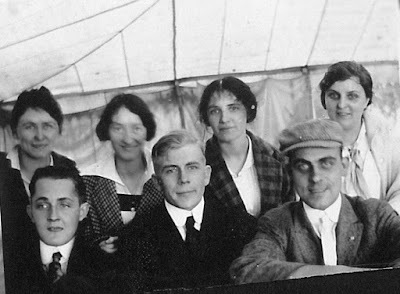 In the snapshot above, he is wearing a hat in a photo with friends. 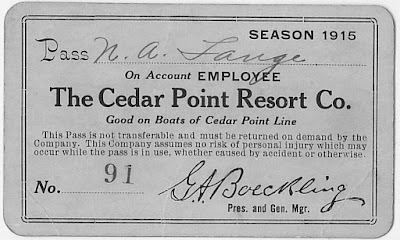 An envelope containing several season passes is included in the Lange scrapbook, including this 1915 employee pass, which was good on all boats of the Cedar Point Line. Note the signature of G.A. Boeckling. 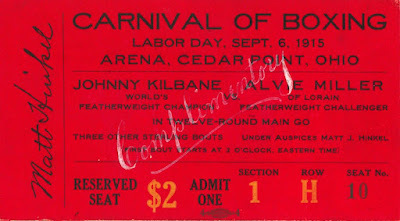 A souvenir program from the Carnival of Boxing held on Labor Day at Cedar Point in 1915 is tucked in the pages of the scrapbook. 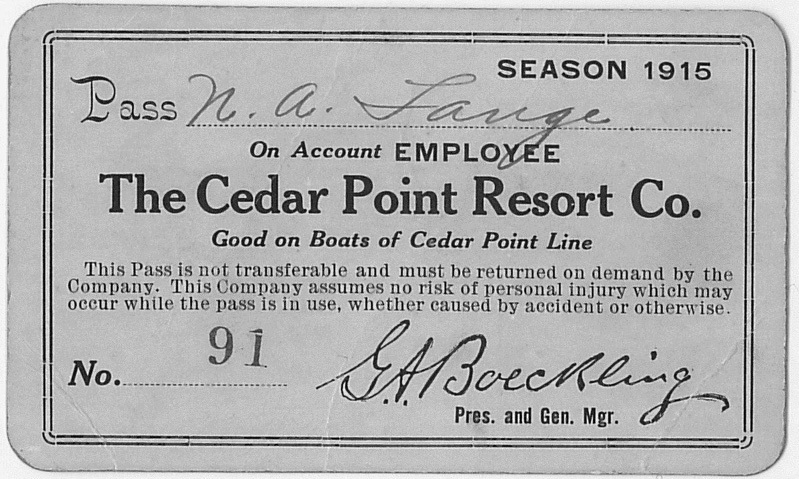 Promoter Matt Hinkel gave away some complimentary tickets to Cedar Point employees. 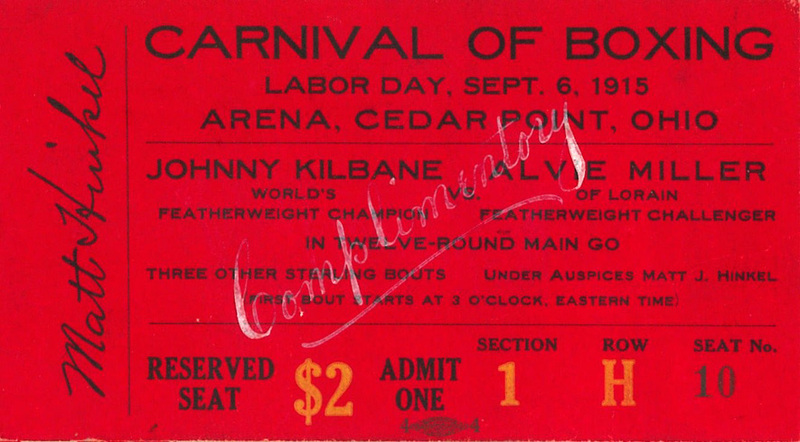 Featherweight champion Johnny Kilbane defeated Alvie Miller of Lorain, Ohio, in twelve rounds. Because of the generosity of the Langes, we have a better understanding of how area residents spent leisure time during the summer of 1915. 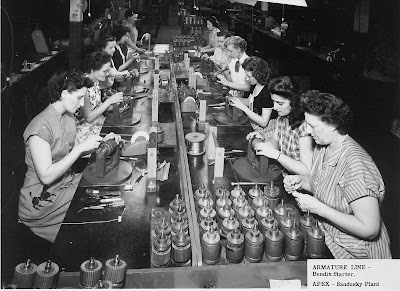 As the United States celebrates another Labor Day, today’s post takes a look back at employees of the Apex Manufacturing Company in Sandusky in the 1940s. 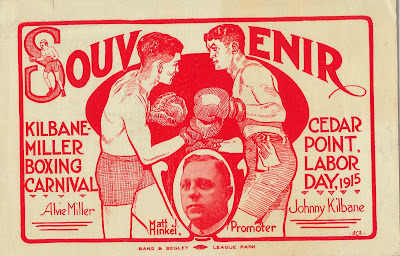 All the pictures are from the Gerald I. Cockerill Collection at the Sandusky Library Archives Research Center. Apex and its predecessor Holland Rieger made appliances, but during World War II, the factory shifted to manufacturing materials needed for the war effort. Below is a picture from the balance operation of Jack and Heintz Starters. 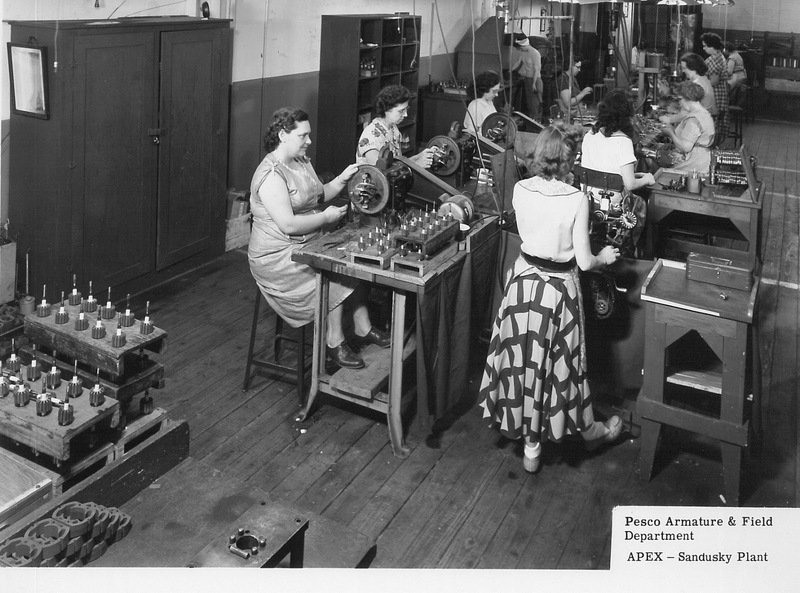 These women were working in the Pesco armature and field department at Apex. The assembly department for Bendix starters can be seen in the next photo. 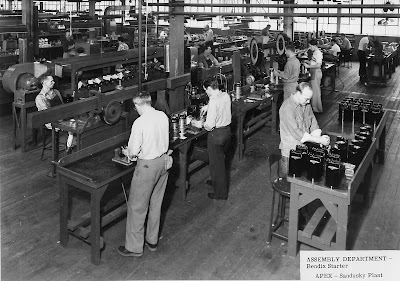 The final picture was taken on the Bendix starter armature line. Visit the Sandusky Library Archives Research Center to view these and hundreds of other historic photographs and documents. 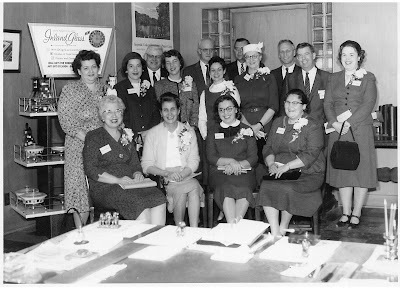 Harley W. Hoffman took this photograph of ten female and five male employees of the Hinde and Dauch Division, West Virginia Pulp and Paper Company sometime in the decade of the 1950s. The ladies are all wearing corsages. Everyone is jovial in this picture, and the styles certainly remind us of outfits that our grandparents may have worn. If you can identify any of the individuals in this photo, please leave a message in the Comments section of this post. 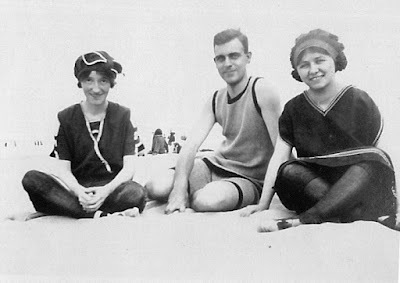 Followers of the Sandusky History blog and the "You Know You're From Sandusky" Facebook Group have identified some of the people in this picture. In the front row, left to right, are: Ruth Holzhauser, Betty LaFene, and Anna Margaret Buchanan. 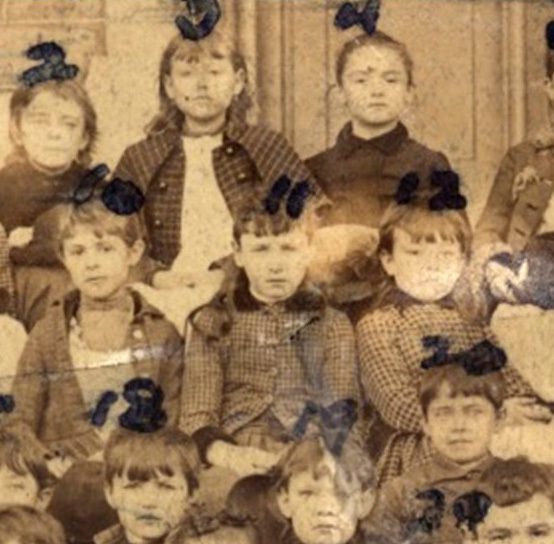 Second person to the left in the second row is Jane Maddrell. The lady in the hat may be Mildred Pietschman McCrystal, and behind her is Hinde and Dauch employee Gordon Wendt. This is a group of local teachers who were participating in an event called Business-Industry-Education Day, or B-I-E Day, sponsored by the Chamber of Commerce. Teachers toured area businesses and factories to see firsthand how local companies operated under the free enterprise system. You can read more about this event in the Sandusky Register Star News of November 2, 1953, now on microfilm at the Sandusky Library.